Well, this is it. It’s January 2012, the time I’ve deluded myself you’ve all been waiting for. At the stroke of midnight the ball had hit bottom and the real countdown began—the fifteen days to the release of Percepliquis. 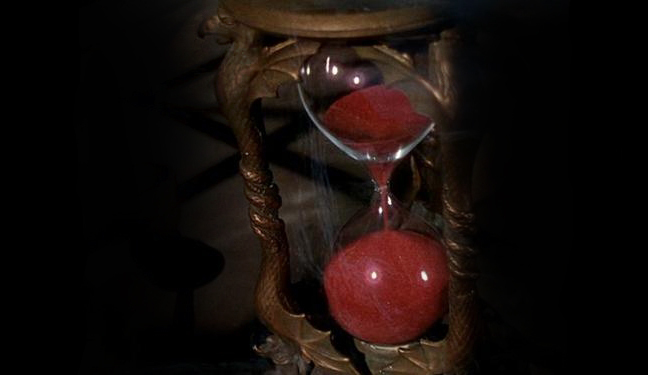 Am I the only one with a six-foot hourglass spilling red sand with days of the week etched on the side? All of you who have just finished Rise of Empire and have been waiting two weeks, think of those who finished Wintertide and have waited nine months. And those who waited nine months think of those who read my books before they were published, but never saw the last book and have waited two years. And those who have waited two years imagine how I feel. I’ve waited—all told—about twenty years for this release. Twenty years of knowing how it would all end, but never being able to tell anyone, never being able to find out if anyone else would think what I created was good. The books have sold well up until now, but no one has known the whole story. You might think you do. You might think you know the characters, and many of you have theories on what will happen, but you’ve been wrong before, and the deeper you get in the series the less confident you may be about the outcome. People who were quick to declare they knew everything after the first book, weren’t so fast to speculate after the second, and by the fifth I had caught enough with my misdirection so that few—if any—publically proclaim they have not been surprised at least once. Two books form the backbone of any series, oddly enough, those are the first and last. The first forms the initial impression. It must be good, or no one will read further. The problem is, the second has to be better in order to be just as good, but the middle books are never held to the standard of the first. Readers expect a lull. The last book—that’s different. The last book is the finale. Everyone expects a massive display of fireworks. It has to be bigger, faster, smarter, funnier, more exciting, more colorful, more beautiful than all the others. It’s why everyone made the journey. No matter how much fun we had on the trail, no matter how many laughs, no matter that we saw a deer, or an eagle, or that half buried flying saucer, when we get to the top of the mountain, we want a view that will make us forget everything that came before as, huh—what? Oh that. Problem is, if you’ve done a good job on that first book, and if you did a better job on the second—now you have to top it. And if the second book had to be twice as good just to be equal with the first, the last book has to blast that away by one of those astronomical distances they always use examples for—if your first book was the size of a grain of sand, your last would have to be the size of the Andromeda Galaxy just to avoid reader disappointment. I really messed up. I tried to make each book a little better than the one that came before it. I purposely shifted the focus, altered the style, and changed the setting of each book to ensure they were distinct and not seen as just a sequel. And each time I raised the stakes. With each book the problems were worse, the outcome more dire, and the odds of success slimmer. It’s like one of those cartoons where one character pulls a knife, the other a pistol, the first a rifle, the second a bazooka, etc. Wintertide was an M1 tank. I should be nervous. I should be concerned that fans won’t like the conclusion, but I’m really not. I know it’s good. I’ve always known that Percepliquis is the best of the series, and not by a little. I hate stories where the ending is a letdown. I didn’t want to do that. I was so concerned, I might have gone a bit overboard. Percepliquis is everything I feel a fantasy novel should be. And while I had to dance around and bluff past the first five in order not to give away the ending, I can finally lay my cards on the table and show you what I’ve really been playing with all this time. I’ve been holding a pretty nice hand to my chest for years trying to keep a stone face, but now all the bets are in. Or rather they will be in two weeks. While I sip my tea and watch the sand spill, here is the first review of the final book of the Riyria Revelations by Scott at Iceberg Ink. Scott’s reviews of the series have always delighted me, and not because he’s a huge fan (although that don’t hurt a bit,) but because he exemplifies the qualities of a good reviewer. He provides opinion with information helpful to a reader in an well-thought out and entertaining fashion, while managing to avoid any spoilers at all. He has done that again with this new review, and all of you can relax and read his comments without any concern of learning something that will harm your reading experience. Scott also, perhaps more than anyone else who I have never personally spoken with, “gets it.” He has always displayed a keen insight into what I was doing and why. That doesn’t mean he guessed where the story was going, but that he knew why it went where it had. Some critics, positive and negative, misinterpret aspects of the story, making assumptions that aren’t true—“Sullivan clearly did this because…” and they are dead wrong. Some give me too much credit and some far too little. I’ve always wondered if English professors who “explain what authors meant” in their writing, have any real clue what they’re talking about. From my own experience I seriously doubt it. Scott gets it, and he’s a careful reader, something I don’t find very often. The writing is easy and flows with a voice that is decidedly deft. This guy knows how to pen a story, no question. In a lot of other fantasy series today there is so much focus on world building that the story itself can get a little bogged down and though it’s not horrible to have that sort of novel out there, it is refreshing to have a book that returns to the roots of the genre, while holding on to a few of the things that make current fantasy books so good. Sullivan cleverly straddles the line between complex thread-built, long arcing plot (which is certainly there, but it is only smoke and whispers....a line here, an idea there...at this point) and a whimsical story with interesting characters that picks you up and whisks you away on a fantastic story that will have you cheering for more. After reading this first review, I kept my eye on this one. Like I said, I’ve had other wonderful reviews of my books, but this guy—he liked the story for all the same reason I did, and saw more than he should. Scott reviewed all five of my books on his site, and now he’s reviewed the last from an advanced copy that I felt he had earned the right to read early. Once again, his review has not disappointed. Thanks Scott…but more importantly, nice review. One of these days you might even get me to watch Doctor Who. Also, Doctor who...YES. Introduced some non-sci-fi friends to it on Friday, they loved it. Start with Blink, it's crazy. Are you serious? You think I'm the only one? That might explain the lack of giant red hourglass sand at Walmart. I'll admit, I'm a latecomer to the adventures of Riyria. I got interested in the series when I first saw the awesome cover art for the newly released books. I read summaries of the books and checked out this blog and decided I had to check it out. Since then I've purchased both Theft of Swords and Rise of Empire on launch day and blazed through them. Fantastic characters, fun and intriguing story, and a world that gets progressively deeper and more fascinating. Thanks for writing some awesome stories, I'll definitely be picking up Heir of Novron on launch day! Can't wait! Will we be able to buy a signed copy of the sixth book from your site like for the other books in the series? Dear Serial-Number-Person wishing to find out if you can obtain a signed copy of Percepliquis, see today's post. I admit that I was one of those who checked out the first book and decided that it was just too simplistic a storyline (sorry, Michael!). But then I stumbled on to your blog (probably via your wife) and I liked a lot of your writing advice. I was especially struck by how you set out to make every book better than the previous one. I've read too many books and series that start out with a bang, but end with a whimper. I figured I'd give your books a try (and luckily my husband happened to be in NoVA for a business trip when you had your launch, yay for good timing!). I'm glad I did, because you've built layers of complexity into the characters as the story went along. It's been fun watching everything unfold and I have high hopes for the last book(s). No pressure there or anything, of course!